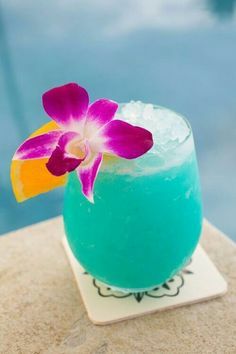 The Blue Hawaii is a tropical cocktail made of rum, pineapple juice, Curaçao, sweet and sour mix, and sometimes vodka as well. Preparation: Combine all ingredients with ice, stir or shake, then pour into a hurricane glass with the ice. For garnish score pineapple or orange slice with a knife and insert onto rim of glass; optionally use toothpick or cocktail umbrella to spear maraschino cherry through center and attach to top of fruit slice; otherwise float cherry on top of ice.